''Mixed Presence Groupware'' is software that realizes these scenarios, connecting distributed ''teams'' together while allowing collocated participants to interact through the system. Mixed Presence Groupware (MPG) supports both co-located and distributed participants working over a shared visual workspace. It does this by connecting multiple single-display groupware workspaces together through a shared data structure. Our implementation and observations of MPG systems exposes two problems. 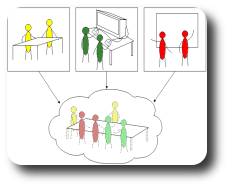 The first is display disparity, where connecting heterogeneous tabletop and vertical displays introduces issues in how one seats people around the virtual table and how one orients work artifacts. The second is presence disparity, where a participant's perception of the presence of others is markedly different depending on whether a collaborator is co-located or remote. This is likely caused by inadequate consequential communication between remote participants, which in turn disrupts group collaborative and communication dynamics. To mitigate display and presence disparity problems, we determine virtual seating positions and replace conventional telepointers with digital arm shadows that extend from a person's side of the table to their pointer location. Mixed Presence Groupware (MPG) supports both co-located and distributed participants working over a shared visual workspace. It does this by connecting multiple single-display groupware workspaces together through a shared data structure. Our implementation and observations of MPG systems exposes two problems. The first is display disparity, where connecting heterogeneous tabletop and vertical displays introduces issues in how one seats people around the virtual table and how one orients work artifacts. The second is presence disparity, where a participant&#8217;s perception of the presence of others is markedly different depending on whether a collaborator is co-located or remote. This is likely caused by inadequate consequential communication between remote participants, which in turn disrupts group collaborative and communication dynamics. To mitigate display and presence disparity problems, we determine virtual seating positions and replace conventional telepointers with digital arm shadows that extend from a person&#8217;s side of the table to their pointer location. Tang, A., Boyle, M. and Greenberg, S. (2005). Display and Presence Disparity in Mixed Presence Groupware. Journal of Research and Practice in Information Technology, Vol. 37, No. 2, May, p71-88.